Small countries with large neighbors can face powerful military threats or irresistible market forces. China presents Taiwan with both simultaneously.1 Taiwan faces a rare dilemma in that its most important economic partner is also an existential threat, politically and economically. Its prosperity depends on its economic interdependence with China, now the world’s second-largest economy. But China explicitly intends to undermine Taiwan’s sovereignty and to achieve unification. China not only seeks beneficial economic relations with Taiwan, but also sees them as a way of promoting unification. It has drawn on its burgeoning economic resources to invest in its military capabilities, deploying advanced fighters and medium-range ballistic missiles, more than a thousand of which are aimed at Taiwan. Most importantly, China continues to threaten to use force to prevent Taiwan from declaring independence and has never renounced the use of force to promote unification. Commercial ties with China therefore pose both challenges and opportunities for Taiwan that are qualitatively different from those presented by any other country; to Taiwan, China is both extremely attractive and uniquely dangerous. The dilemma is obvious: cross-Strait economic ties will carry many benefits, but they will also produce growing economic dependence on a country that is threatening to incorporate Taiwan, possibly by force. Understandably, Taiwan has responded inconsistently to these contradictory pressures. Overall, it has lowered barriers to trade and investment across the Taiwan Strait; more than a million Taiwanese are now estimated to work and live in China and Taiwanese investments in China and two-way trade with China have both exceeded $130 billion. However, the evolution of Taiwan’s cross-Strait economic policies has not been smooth and continuous; it has been characterized by liberalization at some times and restriction at others. Until very recently, Taiwan banned direct shipping and air, postal, and telecommunications links with China. Taiwan began allowing direct investment into China in 1991, taking advantage of China’s 1979 decision to set up special economic zones. But in 1994, in an early policy reversal, the Taiwan government started encouraging investment to flow toward Southeast Asia and away from China. Two years later, the government instituted formal restrictions on large-scale and strategic investments in China with the “No Haste” policy. In 2001, the newly elected Democratic Progressive Party (DPP) government replaced the No Haste with a policy of “Active Opening,” which liberalized some aspects of cross-Strait economic relations, only to reverse course again in 2006 by adopting the more restrictive policy of “Active Management.” In 2008, the Kuomintang (KMT) returned to liberalization by establishing regular and direct air links between Taiwan and China and relaxing previous restrictions on investment in China. It also conducted negotiations on an Economic Cooperation Framework Agreement (ECFA), a preferential trade agreement with China ultimately signed in 2010. But as of 2014, Taiwanese direct investment projects in China still needed case-by-case approval if they involved sums of more than $50 million or restricted industries or products. Furthermore, Taiwanese companies were allowed to invest only a maximum of 60 percent of their net worth into China. A trade in services agreement, a follow-on to the ECFA, even led to the largest sustained public protest in many decades. This pattern of controversy and oscillation calls into question the prevailing explanations for economic relations between nations. Some scholars believe external or structural factors to be particularly important in explaining small states’ foreign economic policies (Rosenau 1966). And the external pressures on Taiwan all point in the direction of liberalization, not restriction or even oscillation. Taiwan’s security guarantor, the United States, has made clear its desire for cross-Strait stability through more economic cooperation. China has likewise used generous economic incentives to encourage liberalization. In addition, the general process of globalization has also produced pressure for liberalization, especially given the natural complementarity between the two economies. Most countries in Asia and elsewhere have relied on China for low-cost labor, primarily for manufacturing; Taiwan has done so more than others, given its geographic proximity, cultural similarities and export orientation. In addition, the world is vying to export goods and services to China’s vast domestic market and growing middle class; Taiwan’s service industry is particularly well positioned to meet such demands as well. Given these structural characteristics of the contemporary global economy, it would be reasonable to expect Taiwan to be compelled to liberalize far more than to restrict. Other scholars focus on domestic political pressures exerted by the interest groups that have emerged in a newly pluralistic society seeking to maximize their economic gain. Taiwan’s political process has become democratic since the mid-1980s, with highly competitive local and national elections virtually every year, often centering on Taiwan’s policy toward China. This approach would focus on the two main competing political parties in Taiwan: the KMT, which is seen as pro-unification, and the DPP, viewed as pro-independence. It would be plausible to predict that a DPP government would therefore adopt more restrictive economic policies toward China and that a KMT government would liberalize those restrictions. However, both the KMT and the DPP have championed liberalizing cross-Strait economic policies in some periods and restricting them in others. During the period covered in this book, there has been little correlation between the identity of the party in power and the content of cross-Strait policy. The oscillation has occurred regardless of which party has held the presidency. The main purpose of this study is to offer a better perspective on Taiwan’s choice of economic policy toward China, especially its oscillation between liberalization and restriction, than can be provided by either of these familiar approaches. Some of the fundamental forces shaping Taiwan’s oscillating policy history actually echo similar changes in other countries. Diverging from forecasts of ever-closer economic integration among trade and investment partners, globalization has actually been accompanied by the resurgence of populism, labor movements, demands for greater economic equality, and quests for economic stability at the expense of liberalizing trade and investment policy (Garrett 1998). Local forces driven by divergent identities and interests are countering the forces of political and economic integration. In short, markets are global but politics are national—and therefore trade and investment policies are often more restrictive or more inconsistent than pure economic logic or structural pressures would predict. The tension between economic growth and other values is more apparent all around the world; Taiwan’s dilemma is distinctive because of the combination of existential threat and economic benefit in its relations with China. In this book, I argue that national identity provides the missing key to understanding the oscillation in Taiwan’s cross-Strait economic policy. Identity is the foundation on which a community prioritizes its collective interests and formulates economic policy toward other communities. When that foundation is weak and identity is contested, prioritizing interests becomes difficult and policy may fluctuate from one extreme to another, as has happened in Taiwan. When the foundation is more consolidated and identity is uncontested, policy may still be debated among groups with differing economic outlooks and priorities, but the range of policies under consideration becomes more limited even if the intensity of the discussion remains high. This, too, has been the pattern in recent years in Taiwan. Taiwan’s economy is now structurally much more reliant on China, both as a market and as a manufacturing base, than it has ever been on any other country. Economic relations between Taiwan and China, including both trade and investment flows, have increased dramatically over the last two decades, as shown in Table 1.1. TABLE 1.1. Cross-Strait Economic Statistics, 1990–2014. Sources: 1. For PRC GDP and growth rate, see International Monetary Fund, http://www.imf.org/external/pubs/ft/weo/2013/02/weodata/weoselgr.aspx; data for 2013 and 2014 are estimates. For ROC GDP and growth rate, see Directorate of Budget, Accounting and Statistics for ROC data, http://eng.stat.gov.tw/mp.asp?mp=5; 2014 data are preliminary. 2. All trade data from Taiwan Institute of Economic Research, “Cross-Strait Economic Statistics Monthly,” no. 263, http://www.mac.gov.tw/ct.asp?xItem=111110&ctNode=5934&mp=3. 3. 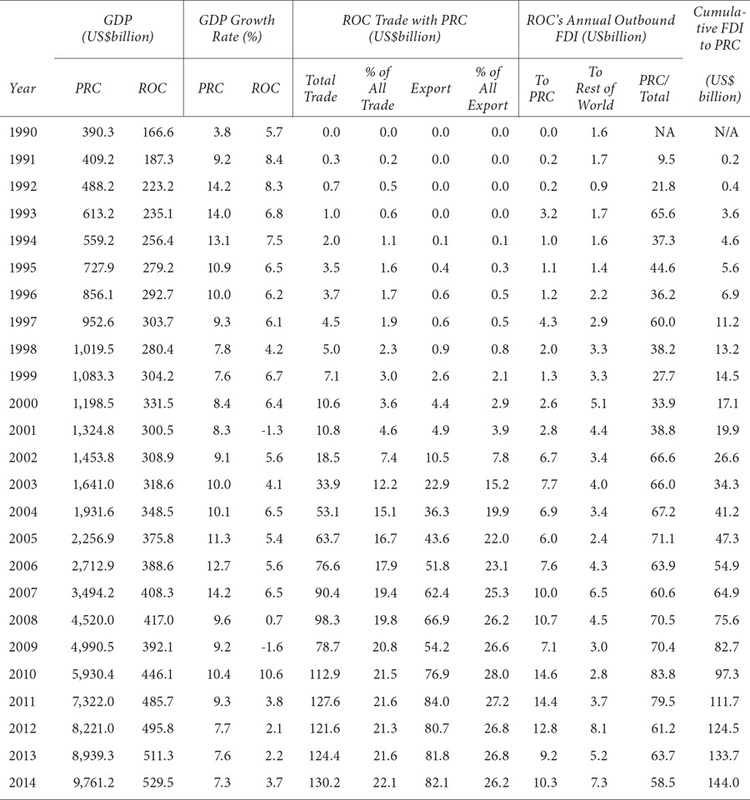 All FDI data from Investment Commission, MOEA, http://www.moeaic.gov.tw/; also available from “Cross-Strait Economic Statistics Monthly.” Includes values of previously unreported investments that were added onto totals originally reported for 1993, 1997, 1998 and all years after 2002. Source: FDI data from Investment Commission, MOEA; also available from “Cross-Strait Economic Statistics Monthly.” Includes values of previously unreported investments that were added onto totals originally reported. As for trade, two-way flows between China and Taiwan reached $130 billion in 2014, representing 22 percent of Taiwan’s total foreign trade and up to 30 percent if trade through Hong Kong is included (Fig. 1.2). Since 1999, China has replaced the United States as Taiwan’s top export market.4 Taiwan’s exports to China have grown dramatically since 1990, from none to 26 percent ($82 billion) of Taiwan’s total exports in 2014, or nearly 40 percent if Hong Kong is included. Similarly, China has been the only country from which imports have consistently risen every year from 1996 onward. 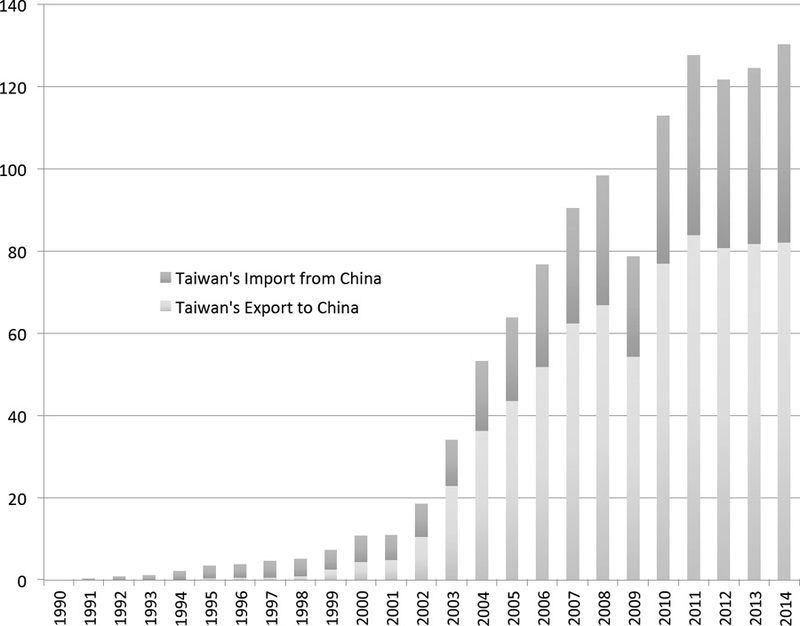 In 2006, China became Taiwan’s second-most-important source of imports after Japan, and since 2014 China has become the leading source of Taiwan’s imports, reaching $48 billion or 18 percent of the total (BOFT 2014). The increase in cross-Strait interdependence reflected in these trends has three characteristics. First, the relationship is focused primarily on long-term capital investment, rather than trade. Up to 85 percent of Taiwan’s information and communication technology exports are manufactured outside of Taiwan—mainly in China—as part of a vertically integrated supply chain. These investments in China are therefore an integral part of many global Taiwanese companies’ strategy and cannot easily be relocated once they have been made. This is a very different pattern from commodity trade, where alternative sources can be found if one country can no longer supply a certain commodity. A second characteristic is the qualitative change in the type of Taiwanese trade and investment. Initially, Taiwanese invested in export-oriented factories, often relocating factories previously situated on Taiwan. However, Taiwanese companies and entrepreneurs in China, known as Taishang, now want to sell their finished products in China, one of the fastest-growing domestic markets in the world. Making the products in China for the Chinese market gives the manufacturer a “just in time” advantage—as well as a cost advantage—over exports from Taiwan. In addition to components and raw materials, a large amount of the most advanced technology and machinery for these factories, especially for Taishang in the technology sector, is imported from Taiwan. As a result, economic interdependence with China has become unavoidable if Taiwan wishes to continue to reap the benefit of a growing global economy. China’s economic opening has restructured the regional and the global economies; it has become the “factory of the world” and, importantly, one of the world’s largest consumer markets. China has become an integral part of the global supply chain and the most important economic engine for Asia and the world. Therefore, Taiwan has very few alternatives if it wishes to diversify its outbound investments and trade flows away from China in order to hedge against economic and political risks. Taiwan’s main competitors, from Korea and Japan to Thailand and Indonesia, have all become dependent on investing in and trading with China. As an economy dependent on trade, which represents more than 100 percent of its GDP, Taiwan cannot be an exception. The changing economic balance between China and the United States has also shifted Taiwan’s economic activities away from the latter and toward the former. Whereas China and Hong Kong constituted nearly 30 percent of Taiwan’s total trade and nearly 40 percent of Taiwan’s exports in 2014, the United States, which constituted 24 percent twenty years before, now represented only 11 percent of Taiwan’s total trade and exports (BOFT 2014). A final implication is that the economic balance of power between Taiwan and China has shifted dramatically, again in China’s favor. At the beginning, Taiwan’s investments and subsequent trade were extremely important for China. Taiwan was unique in its interest in China, especially after the 1989 Tiananmen crisis, when many multinational firms reduced their presence. Taiwanese companies expanded their global manufacturing capability by providing the capital, technology, and marketing that could leverage China’s low-cost labor. When cross-Strait trade and investment began, Taiwan was growing faster than China. This changed in 1991. 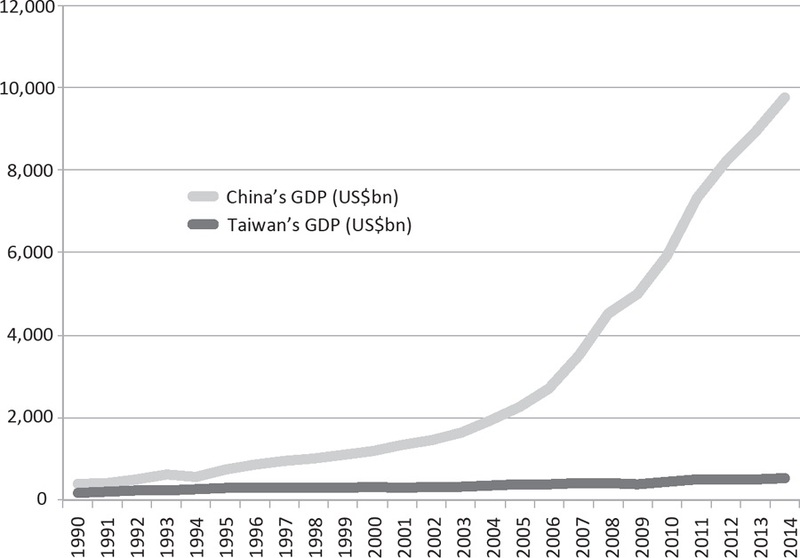 Between 1990 and 2014, China’s GDP grew more than twenty-fivefold, whereas Taiwan’s grew by only three times (Fig. 1.3). In 1990, China’s economy was only a little more than twice the size of Taiwan’s, despite the huge discrepancy in population, whereas in 2014 China’s was more than eighteen times larger (Table 1.1). 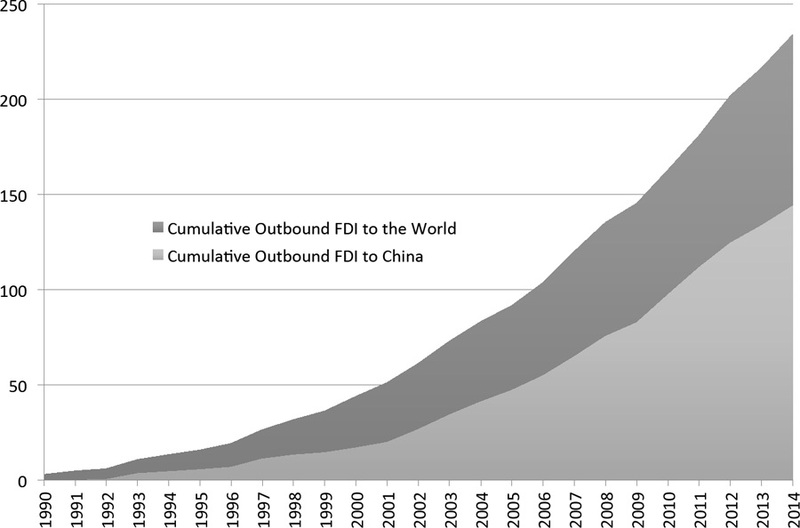 In terms of FDI, China has become one of the world’s leading investment destinations, reaching the top position in the world for inbound investment in 2003 and attracting nearly $124 billion of FDI in 2013 compared with Taiwan’s inflow of less than $4 billion.6 Foreign trade also shows great disparity, with China’s global trade exceeding Taiwan’s by more than seven times in 2014 (TIER 2015). Taiwan’s comparative advantage relative to China has continued to erode, as demonstrated by the decline of Taiwan’s share of China’s total trade to only 3 percent by 2014.7 In short, China has become a global economic powerhouse with a far more diversified international trade and investor base than Taiwan’s. Source: For PRC GDP and growth rate, see International Monetary Fund; data for 2013 and 2014 are estimates. For ROC GDP and growth rate, see Directorate of Budget, Accounting and Statistics for ROC data; data for 2014 are preliminary. These structural shifts in cross-Strait economic relations have had important implications for Taiwan. As Taiwan’s productivity and growth slow and the birth rate drops, its competitiveness continues to decline. Unless Taiwan’s trade and investment policies are formulated to avoid structural over-dependence, Taiwan will become more vulnerable to potential political and economic crises in China than other countries are. More importantly, over-dependence will inevitably give China greater leverage and reduce Taiwan’s political autonomy. This is what has created Taiwan’s China dilemma. Unlike Taiwan’s economic policies toward other major trading partners, its cross-Strait economic policies have been characterized by periods of economic liberalization (promoted largely by Taiwanese businesses), followed by more restrictive measures (after a strong public outcry from those who feared negative consequences), then renewed liberalization once the costs of restriction became evident. This oscillation reflects public ambivalence toward cross-Strait relations. In polls conducted in July 2014, almost the same number of respondents thought the pace of cross-Strait exchanges was “too fast” as thought it was “just right”; only a few thought it was “too slow.” More than half thought the Chinese government was “hostile toward both the Taiwan government” and the Taiwanese people (MAC polls, July 2–7, 2014). The public is ambivalent toward not only the general relationship between Taiwan and China, but also liberalization of cross-Strait economic policy. Immediately after the signing of the ECFA, only 36 percent of the respondents felt more confident about President Ma Ying-jeou’s policies than before; 31 percent felt less confident (GVSRC, June 10, 2008; July 21, 2009; July 20, 2010). By 2013, a majority of Taiwanese were dissatisfied with the government’s management of cross-Strait relations, an all-time high, and in particular 71 percent lacked confidence in the government’s ability to protect Taiwan’s interest in cross-Strait negotiation (TVBS, Oct. 24–28, 2013). Many analysts have focused on domestic factors to analyze this dilemma and the oscillation it has produced (e.g., Kastner 2009; Rigger and Reid 2008). As elsewhere, the challenges of globalization have produced protectionist pressures in Taiwanese society. Interdependence has created winners and losers as resources are redistributed. With increases in the flow of goods, capital, and talent, social tensions over inequality and unemployment are magnified. Establishment of a fully democratic political system empowers divergent social interests to express themselves on this issue more vocally. However, an analysis of the domestic repercussions of globalization cannot provide a complete explanation of the oscillation in Taiwan’s economic policy toward China. How countries deal with such issues depends on the size of their economy. Usually, small export-oriented countries like Taiwan cannot afford protectionism; they can ameliorate the negative consequences of globalization only through social-welfare policies and retraining programs for displaced workers. Only rarely do smaller countries turn to restrictive foreign economic policies, because the cost is usually severely reduced growth. There are many examples of the cost of restriction to small economies, such as Peru, Venezuela, Ecuador, and Bolivia closing off trade from the 1950s to the 1980s and Malaysia temporarily instituting capital controls during the 1997 Asian financial crisis. Short-term growth inevitably slows down, as the price for somewhat greater stability and control. By contrast, larger countries can more easily engage in protectionist policies such as higher tariffs or agriculture subsidies, since they can rely on their own domestic markets for consumption and employment.8 What is distinctive about Taiwan is not only that such a small export-oriented economy has restricted trade and investment, but that it has done so only with China, its economic lifeline, and only episodically. As an alternative to focusing on the distributive results of liberalization, a more sociological perspective examines the evolving definition of Taiwanese identity. Identity-related factors may better explain the selectivity and oscillation that distinguish Taiwan’s economic policy with China. China’s efforts to isolate Taiwan internationally and to use economic interdependence and military pressure to promote political integration—in other words, to make Taiwan believe that it has no alternative to unification—have ironically contributed to a stronger sense of Taiwanese national identity. In contrast to 1989, when one survey showed that 52 percent of respondents still felt “Chinese,”9 major polls from 2010 onward show that the majority of the public have viewed themselves as “Taiwanese” (e.g., ESC 2014). This Taiwanese identity grew in tandem with the localization and democratization of the island’s government and the idea that Taiwan is an independent sovereign state. Thereafter, some Taiwanese opinion leaders feared that economic interdependence with China would dilute Taiwanese identity. This certainly explains how protectionism toward China was sometimes associated with the emergence of a Taiwanese identity, but it does not answer why some advocates of a unique Taiwanese identity disagreed with restrictive economic measures and supported liberalization of cross-Strait economic policy. Just as Taiwan’s China dilemma cannot be adequately explained by the politics of trade, neither can it be fully explained by differences over identity. Taiwan is trying to remain economically competitive yet politically autonomous as a democratic political entity, defying external pressure to integrate more deeply with China both politically and economically. Although a structuralist analysis focused on the global political economy might suggest that Taiwan can cast its economic and perhaps political lot only with China, Taiwanese society believes there is a choice to be made, and the outcome of that choice is fiercely debated. This book offers a more inclusive approach to analyzing this debate that synthesizes structural perspectives, the politics of trade, and an analysis of identity. Recent research on Taiwan’s economic policies toward mainland China has been dominated by scholarship focusing on rationalist analysis of international structure of domestic economic conditions, but it is clear that these approaches are inadequate—and that incorporating noneconomic and domestic factors such as ideology and identity is important (Hinich 2006). Even for small states, the external environment does not completely determine changes in foreign economic policy (Katzenstein 1985, 2003). Furthermore, even though rationalist analyses centering on economic interests can be helpful in understanding the political consequences of the redistributive effects of economic liberalization,10 in order to fully understand foreign economic policy we need to consider how identities are constructed and how they lead to the choice of one set of policies over another (Hall 1993; Weingast and Wittman 2006). What has been missing in analyses of cross-Strait economic policy is attention to the intensive debate on national identity and the relationship between that debate and economic policy. Without considering the social context of shared beliefs, rationalist logic fails to explain the origins of or the priorities assigned to competing interests. This study therefore uses an eclectic analytic framework that focuses on identity as well as economic interests and treats an analysis of identity not as an alternative to other explanations but as a complementary approach that enriches them. Identity is treated as an integral part of a more comprehensive understanding of how the Taiwanese have dealt with their China dilemma. The core argument in this more inclusive analytical framework is that identity forms the basis for defining interests. Economic interests cannot be formed in isolation from identity. National identity is the foundation on which interests are defined and policies made. Identity serves as a guide for people to form preferences for policy outcomes. Neither identity nor normative ideas that distinguish right from wrong are centered on material interests alone (Goldstein and Keohane 1993). A full understanding of Taiwan’s cross-Strait economic policy must integrate the distributive effects of trade and investment with China and consolidation of Taiwanese identity as influences on policy. A sense of identity provides a community with specific objectives to pursue, whether political or economic. When identity is consensual, such goals are clear and can be pursued with rational considerations. But a contested sense of identity, as Taiwanese have collectively experienced until very recently, makes it difficult to agree on a stable economic policy because it produces disagreement over both national goals and the means to advance them. In sum, this study seeks to understand the evolution of cross-Strait economic policies through an examination of the relationship among national identity, economic interests, and foreign economic policy by tracing the historical processes that have led to changes in both identity and policies over two decades. In addition to examining the domestic and international context, this approach employs discourse analysis and adds personal narratives to rationalist analyses of policy (Bates et al. 1998; Geddes 2006; Geertz 1973). It examines public and elite opinion on national identity and economic policy through opinion polls and extensive interviews with officials, legislators, business leaders, journalists, representatives of interest groups, and policy analysts.11 Primary material, including newspapers and government sources, is used to interpret further the motivations, perceptions, and preferences of societal and governmental actors. Secondary material is also used to broaden the perspective. Chapter 2 elaborates the conceptual framework that will be applied in later chapters to four episodes in the evolution of cross-Strait economic policy since Taiwan first liberalized economic relations with China. The chapter reviews relevant approaches that can be used to understand the oscillations in cross-Strait economic policies, and it introduces the eclectic analytical framework that will be employed to describe the connection between identity and policy. Chapters 3 to 6 analyze four empirical episodes, with accompanying sectoral case studies, using this new analytical framework. Chapter 3 introduces the first episode, during which Taiwan adopted its first major change in economic policy toward China. After the death of Chiang Ching-kuo and democratization, the content of Taiwanese national identity became greatly contested, especially under President Lee Teng-hui’s tenure as president between 1988 and 2000. Concerned about the economic future of Taiwan, particularly given the initial liberalization of economic relations with mainland China, Lee inaugurated Taiwan’s first, albeit relatively weak, effort to redirect trade and investment away from mainland China to Southeast Asia in 1994. After the 1995 missile crisis, Lee rolled out the tougher No Haste policy, formalizing the earlier restrictions on cross-Strait economic relations. A National Development Conference (NDC) was held in 1996 in order to mobilize what appeared to be overwhelming support to adopt and implement this policy. However, a case study of the proposed investments by a major petrochemical company illustrates how the dispute over identity and policy persisted during the implementation stage. Chapter 4 analyzes the DPP’s decision in 2001 to free cross-Strait economic policies from some of the constraints that had been in place since 1996. During this episode, the continuing debate on national identity intensified, but “Taiwanese” identity appeared to be gaining ground over an exclusively “Chinese” identity. After coming into office as Taiwan’s first non-KMT president, Chen Shui-bian was confronted with a KMT-controlled legislature and a severe economic slump. Despite the DPP’s record of favoring independence and its opposing economic relations with China, Chen concluded that liberalization would be the most effective way to restore economic growth and strengthen his political base. This was a major reversal of DPP policy and refuted the idea that the party that promoted Taiwanese identity and independence would always favor restriction. The government organized a large-scale Economic Development Advisory Conference (EDAC) to discuss the policy change—and rolled out the Active Opening policy, relaxing the KMT’s restrictions on investment in China. In the end, however, with the government divided and divergent voices emerging in a more democratic Taiwan, Chen’s move toward relaxation proved even more controversial than the previous episode. The first of two case studies on the semiconductor industry illustrates the continued debate on identity and policy choice. On the basis of the first two episodes, I posit that a high level of contestation over Taiwan’s national identity led to a perceived choice between extreme cross-Strait economic policies; the debate over those extreme policies was intense and ideological, and was evident during both policy making and policy implementation. Ironically, because of their competition for electoral support, the political parties actually reversed their positions in these two episodes: in the first episode, the “Chinese”-identified, pro-unification KMT supported restriction, while in the second, the “Taiwanese”-identified, pro-independence DPP supported liberalization. The third episode, analyzed in Chapter 5, began with the government reintroducing restrictions on cross-Strait investment in 2006. During this episode, a largely “Taiwanese” national identity had become dominant, although few preferred immediate independence. After one full term in power, Chen Shui-bian had been unable to reverse the economic downslide or engage China in any dialogue. As a result, the DPP fared poorly in elections, winning the 2004 presidency by only a razor-thin margin and receiving a small percentage of the vote in several subsequent local elections. Mired in personal scandal and facing a growing national budget deficit and declining popularity, Chen sought to appeal to the more extreme elements in his political base by restricting investment in China through the Active Management policy. With the aim of mobilizing support for such restrictions, he convened the Conference on Sustaining Taiwan’s Economic Development (CSTED), but its results were more superficial than those of the two previous conferences; it was unable to pass any formal resolution endorsing Chen’s proposals. A follow-on case study on the semiconductor industry demonstrates that the disagreement over implementation of the new policy focused on expected economic costs and benefits, with little discussion on identity. Chapter 6 begins with the presidential elections of 2008, when the KMT regained power after eight years of the DPP’s erratic economic policies. Its successful presidential candidate, Ma Ying-jeou, launched another period of liberalization. In this fourth and final episode, national identity was largely consolidated, but again, the majority of Taiwanese showed a preference for political autonomy rather than formal independence. They also accepted some degree of cross-Strait economic integration but wanted it to become more institutionalized. Cross-Strait negotiations on economic relations resumed after a fifteen-year hiatus with a succession of formal meetings between Taiwanese and Chinese representatives. Each meeting was followed by a set of bilateral agreements to liberalize cross-Strait economic relations. Ma also announced his intention to work toward a memorandum of understanding (MOU) on financial regulation that would liberalize establishment of banks, securities, and insurance companies on both sides and toward an even broader framework agreement, the ECFA, that would gradually normalize trade and investment relations, which was signed in June 2010. But these far-reaching liberalization measures generated an equally unprecedented restrictionist backlash. By organizing several conferences in Taiwan and even abroad, many open to the public as well as to elites, the government tried to quell public protest as a debate raged over how liberalization would affect the competing goals of international recognition, growth, equity, stability, and security. The book’s final case study, on the dramatic student-led protests in 2014 against ratification of the agreement on trade in services envisioned in the ECFA, describes the discussion of the costs and benefits of this most recent set of liberalization measures. Supporters and opponents alike now made arguments based on rational and pragmatic considerations as well as identity. On the basis of the latter two episodes, I posit that as a consensus on identity was forged, the nature of the debate shifted from ideological to pragmatic. The alternatives considered in the policy-making and implementation stages moved toward the center. But I also posit that even though narrowing the spectrum of policy options eliminated the extremes, it did not produce a consensus on the remaining options during policy making or during the subsequent implementation stage. The consideration of those alternatives became more pragmatic, but was conducted with equal if not greater intensity. The four episodes demonstrate how a contested and dynamic national identity has shaped identification of interests and discussion of policy. During the first episode, a heightened sense of military threat from the Chinese led the Taiwanese to prioritize security, but a fractured identity led them to debate extreme options about how to enhance it. Hard hit by a global recession in the second episode, the Taiwanese continued to struggle with defining their national identity, but now focused on restoring economic growth. In both episodes, the dispute over policy was inextricably linked to a high level of contestation over national identity. In the last two episodes, Taiwanese national identity became the commonality on which policy discussions were grounded. However, as the range of interests being considered broadened, there was still no agreement on how to prioritize those interests. Although the discussions were more rational and the options considered were much less extreme, the debates remained heated and consensus elusive. The last chapter summarizes the findings of the four empirical episodes, with a particular focus on cross-Strait economic relations after the signing of the ECFA. It discusses this study’s implications for political leaders in Taiwan, for the future of cross-Strait relations, and finally for theories of international political economy. Some observers believe that recent economic integration, as promoted by the ECFA, can lead to reduced tensions and even cross-Strait political reconciliation. But the current wave of trade liberalization must be understood in the context of the consolidation of an identity that is primarily Taiwanese rather than Chinese. The high level of support for the trade-promotion aspect of the ECFA and for creating institutionalized mechanisms for trade with China was built on the foundation of this Taiwanese identity (S. Lin 2013a). This consolidated national identity has allowed Taiwanese to separate their preferences for Taiwan’s political future from those for its economic relationship with China. Support for greater economic integration is still accompanied by a demand for continued political autonomy. 1. The terms Republic of China (ROC), Taiwan, and Taipei are used here interchangeably. For the People’s Republic of China (PRC), the terms China, the mainland, mainland China, and Beijing are also used interchangeably. 2. All figures in this study are quoted in U.S. dollars ($), or in NTD (NT$). 3. Official data on cross-Strait trade and investment differ between Taipei and Beijing, and unofficial estimates vary widely; see table 1 of TIER 2015 for comparison. As of year end 2008, for example, Rosen and Wang (2011, 6–36) estimated that Taiwan was the leading FDI investor in China, with cumulative investments at $130 to $150 billion, approximately double the official figure from Taipei. 4. PRC data have consistently shown much higher figures. For example, PRC Customs reported total trade with Taiwan of $198 billion (NBSC 2015) compared with $130 billion reported by ROC Customs (TIER 2015, table 1). It is almost impossible to be precise about the amount of cross-Strait trade because so much of it flows through Hong Kong. Before direct trade was allowed, all trade and investments went through third countries, primarily Hong Kong. 5. ICMOEA tracks FDI figures on a monthly basis, http://www.moeaic.gov.tw. 6. For FDI comparison, see UNCTAD 2014. National data differ from the UNCTAD data. 7. Calculation according to TIER; NBSC figures are higher, with Taiwan representing 4.6 percent of China’s total trade in 2014. 8. Closing off trade to implement import-substitution industrialization has been demonstrated to affect large countries substantially less than it affects small countries (Rodriguez 2010). 10. Examples of such analyses include Frieden 1991; Frieden and Rogowski 1996; Rogowski 2003. 11. Although it is difficult to establish the linkage between public opinion and foreign policy, as Rosenau (1961) suggests, the Taiwanese government’s policy orientation has increasingly reflected public opinion;. For example, studies of forty-one major policies between 1996 to 2000 showed that only 24 percent failed to correspond to the opinions of the public and the elites (Yu 2002, 137–38).